Pasta. Oh how I could live on you. I’m a big pasta consumer, love it! When I lived at home with my parents I used to eat it at least three times a week, and people always thought it was strange, but pasta is such a staple for an Italian household (I say Italian even though my mum is Australian and we live in Australia, but experience a meal with my family and it's clear which side is stronger). It’s so quick and easy to cook, not to mention versatile. At some stage I will post a recipe for a great pasta ragu which is my all time favourite, but for now I would like to share a little pasta dish I made last night. I’ve had this recipe in my file for ages, maybe a good two years, and I’ve always wanted to make it. I’m not sure who invented the recipe, but it did come from an old Madison magazine. Last night while driving home I remembered it, so quickly popped into the shops to pick up a zucchini. When I got home I realised the recipe called for baby spinach leaves as well, which I didn’t have, so I used fresh basil leaves instead. 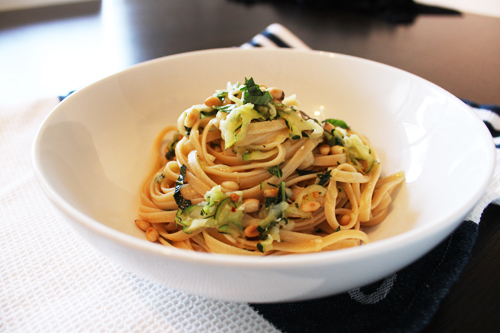 The pasta was just lovely – light, zesty, and nutty. A bit different from a traditional plate of pasta, but still very good. At first I didn’t put any parmesan on top, but after a couple of mouthfuls I realised it needed it. Cook the linguine in a large pot of salted boiling water until al dente. Drain and return to the pot. Turn the heat back on and add the rest of the ingredients to the pot and season well with the salt and pepper. The pasta and zucchini will absorb the oil quickly so add more should it need it. Toss everything well, and serve with grated parmesan. I love the look of this dish, zucchini and lemon sound very summery. The photography is getting really pretty! Don't you cook the zucchini a little? Thanks for the feedback! You will find that the zucchini will cook from the heat of the pot and pasta. When mixing through all the ingredients, you can turn the heat back on low, and this will cook it further. Being grated, it won't take long. Another alternative is to cook the zucchini and garlic in the oil before adding the pasta and remaining ingredients. I made this pasta last night for seven people and everyone loved it! The flavours work so well together - it is nice and light and fresh. It obviously suited the tastebuds of my vegetarian friend, and for the hungry boys I served some simple grilled chicken on the side. The only downside is that there is none leftover for me to eat today! Fabulous recipe Tash! Keep up the good work.